Memorial Day can mean many different things to Americans. For some, it’s a day of fun with the family, enjoying a picnic or grilling out. It’s the day children flock to their local swimming pools. For many, the last Monday in May is the unofficial start of summer; the day they can finally break out their white wardrobe. It seems that we may have forgotten what inspired the holiday in the first place. For others, however, the true meaning of the holiday is all too personal. Every year, the friends and families of hundreds of thousands of fallen soldiers use this day to remember these heroes. These Gold Star families spend their holidays at the cemetery, honoring the memory of their loved ones who paid the ultimate sacrifice for our freedom. It is not a simple, relaxing day filled with barbecue. Instead, Memorial Day is a solemn, somber and heavy holiday. However, Gold Star families have found support and a sense of community in each other. It’s a family no one plans to join or wants to be a member of, but the Gold Star community is truly inspirational. Members band together to lift one another up, make sense of their loss and navigate the lengthy and painful grieving process. Each Memorial Day, cemeteries will be filled with Gold Star families remembering their loved ones, supporting one another and healing together. 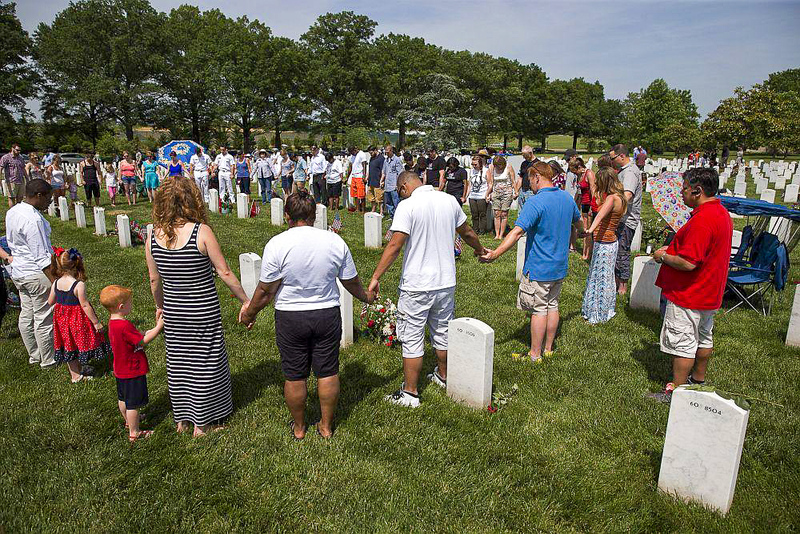 On Memorial Day 2014, a spontaneous prayer circle formed as families visited Section 60, where many of the soldiers who died in Iraq and Afghanistan are buried at Arlington National Cemetery. Community wellbeing can mean many things, but generally refers to living well, both as a community as a whole and as an individual within it. When community wellbeing is high, all members benefit. While it is more obviously socially and emotionally beneficial, community wellbeing has been found to have significant impacts on all aspects of wellbeing, even one’s physical health. Having a sense of community pride, joy and belonging is incredibly important to humans, becoming invaluable after suffering tragedies or in times of hardship. This is why the community Gold Star families have built is not only meaningful, but crucial to their wellbeing. Predictive Health Partners applauds this community, the sacrifices they have made for our freedom and their dedication to caring for one another. This Memorial Day, Predictive Health remembers the men and women who have died in service to our country, as well as the families who they left behind. Join us in a moment of reflection on their sacrifices this Memorial Day with the video below. We also invite you to join us in donating to the Fallen and Wounded Soldiers Fund, which uses 97% of its donations to help the families of severely wounded or fallen soldiers with living expenses and provide other forms of assistance. Donate here to support these heroes and their families. ← How Are You Doing on These 2018 Healthcare Trends?